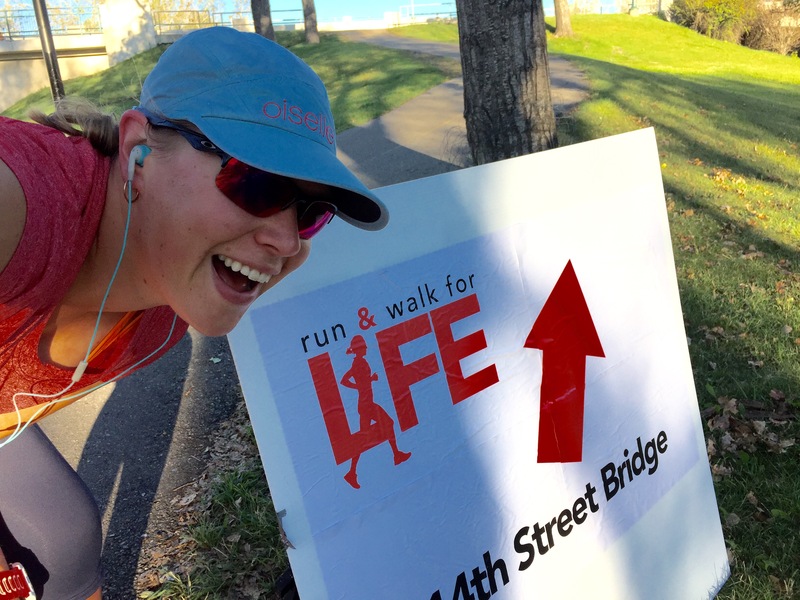 Yesterday I had the opportunity to race the St. John Ambulance Run and Walk for LIFE 5K! With Cookies By George at the finish line it was hard to pass up the opportunity to race! I had to run a bit longer than 5K this weekend so to make it happen I ran from home to the race start to get some extra time in. It was a bit brisk out but my legs felt great and I really enjoyed the run. I even spotted some course markers along the way! I grabbed my race packet, bib and t-shirt when I got to Eau Claire Market and it wasn’t long before we were being led in a Zumba warm up. I learned that I am not very well coordinated at Zumba, but I did need something to wake up my muscles because it was cold just standing around! The 10K runners took off first, then 5 minutes later the 5K runners would go, followed by the 5K walkers. My goal for the race was to run strong and execute a good race. I’m often guilty of starting off really fast in the first mile and then I can’t hold on through to the finish. 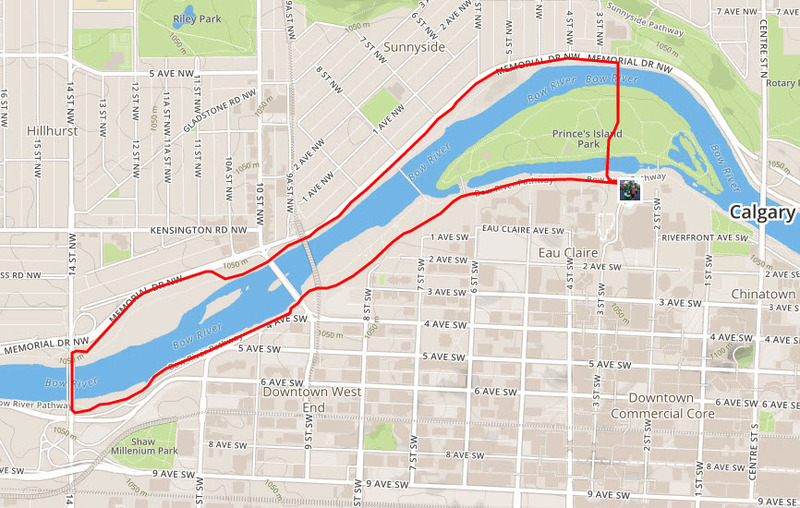 The course was nice and flat as we followed the pathway along the Bow River, with the exception of when we had to run up and cross over the bridges. I turned on some tunes and focused on a few people ahead of me and tried to not look at my Garmin. My legs were still feeling a bit stiff from the cold but it only took a few minutes before they came around. The first mile clicked off in 9:35. I wound up catching up to the people ahead of me I had been focusing on about 1.5 miles in so for the most part I was on my own. Mile 2 clocked off in 9:11. 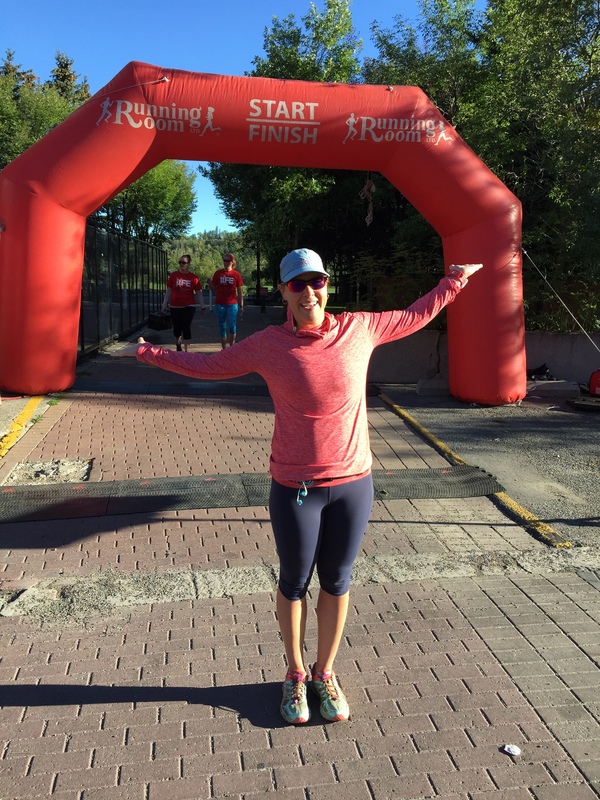 Now it was time for the self talk…to keep my effort strong when I wanted to slow down. I told myself that the faster I ran the faster I would be done. I focused on the fast beat in my music. It was time to push! Mile 3 clicked off in 9:07 and I crossed the finish line in 28:06…good enough for third female over all! And sampled some iced Bear Trap tea from David’s Tea. There were also Spolumbo’s sausages being grilled up for everyone! Thank you to the team at St. John’s Ambulance and all of the sponsors who helped to put on a great race. There was lots of volunteer support with two water stations on the course. Evolve Chiropractic was on hand for post-race massages and X92.9 was giving away iTunes downloads and Big Chief Beef Jerky samples. Careful Curtis the dragon was even on hand to cheer on the runners. All in all a great day! Congratulations to everyone who took part. It was great to see so many people supporting a great organization! 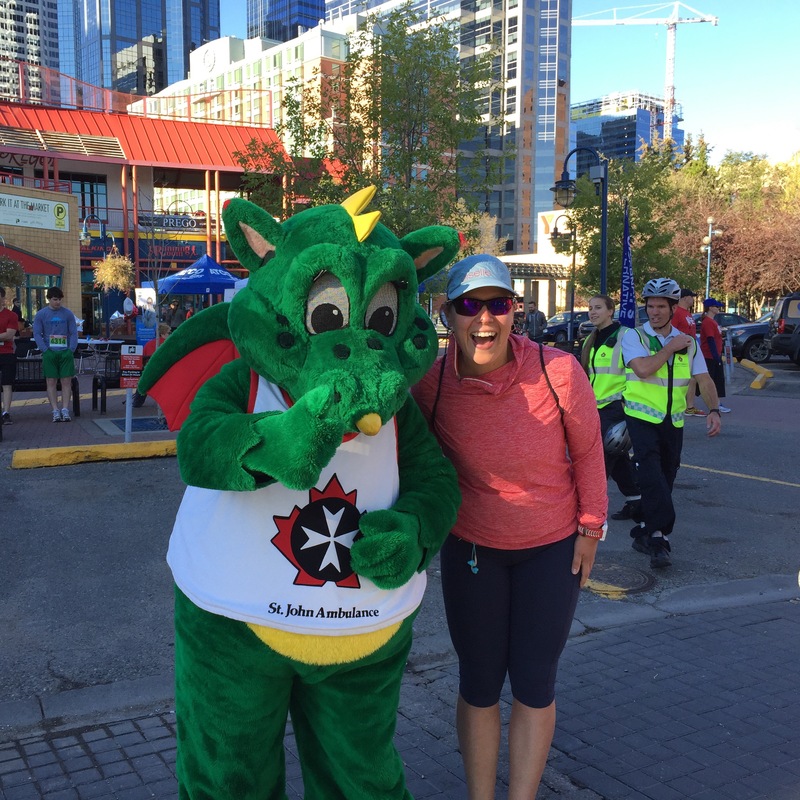 Coming Soon: The St. John Ambulance Run and Walk for LIFE! I did this last year and had a lot of fun!!! what a great race! And a good cause! 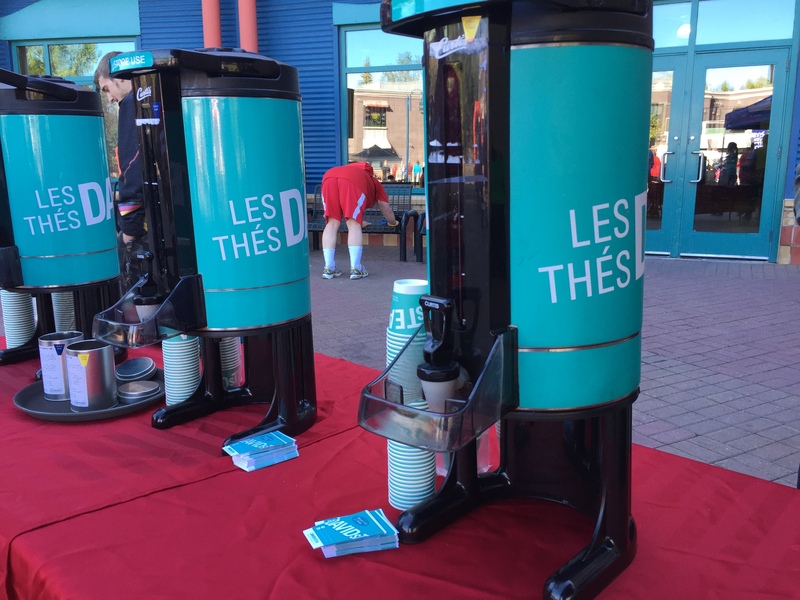 tina G recently posted…Cawfee Tawk: How do you take it? Congrats on third female overall -that’s awesome!! Great job on the negative splits! And the podium! 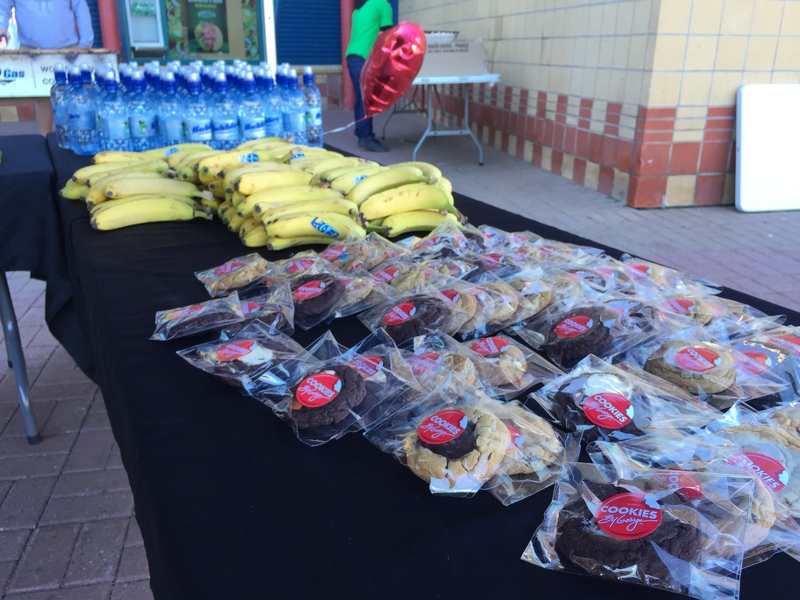 Wow so much awesome munchies at the finish!! Congrats on a great finish time and placing 3rd! Congratulations on finishing yur race. Sounds like a great event. It’s always nice to have treats at the end. lacey recently posted…Are these runs Official?